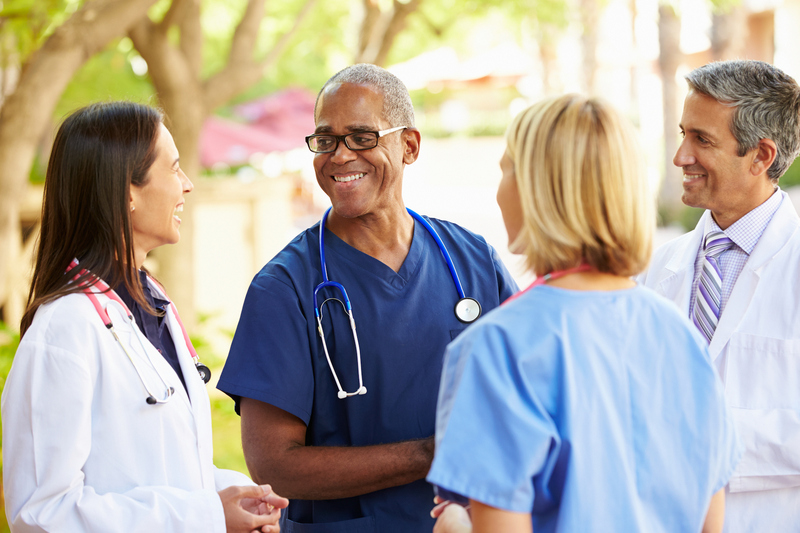 As part of our Expanding the Science and Practice of Gratitude project, the GGSC aims to both raise awareness about the benefits of gratitude in health care settings—such as healthier patients, more resilient staff, and more collaborative organizations—and provide health care professionals with practical tools that can help put gratitude research into practice. To that end, we have produced the following resources and initiatives. Our Gratitude as Medicine Survival Kit is designed to help health care organizations support the health of those under their care—staff and patients alike—by drawing on the practices and benefits of gratitude. It is based on the latest gratitude science, along with best practices from several of our health care partners: Dignity Health, Kaiser Permanente, Sharp Best Health, Scripps Health, and Sutter Health. The Science of Gratitude Resource: a list of relevant studies, articles from Greater Good magazine, videos, quizzes, and books. You can also download a Powerpoint version of the Why Gratitude Matters in Health Care slides—it includes presenter notes to help you deliver the presentation to colleagues. 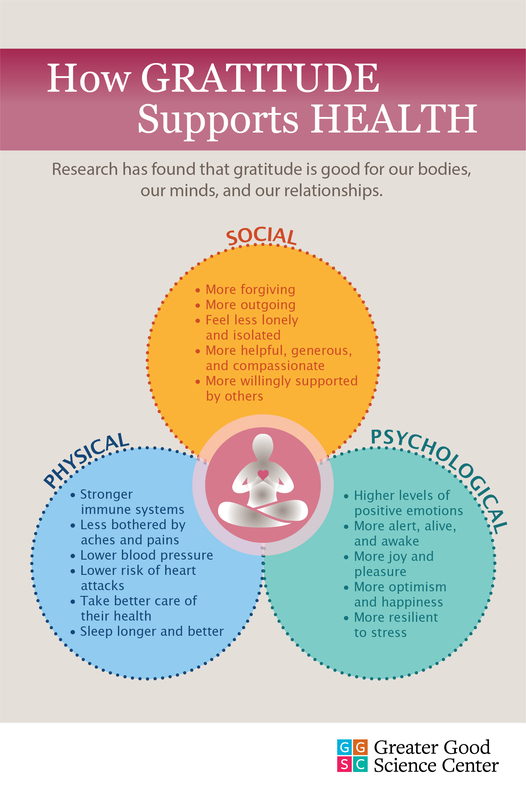 You can also download the How Gratitude Supports Health infographic as a print-ready PDF or as a jpg for the web. We extend our gratitude to the many health care organizations who have helped to inform this resource, the John Templeton Foundation for making it possible, and to Catherine Brozena of ColorThisWorld Communications for her work on it. The GGSC has partnered with a variety of health care organizations to run 21-Day or 10-Day "Gratitude Challenges," using the GGSC's online platform for gratitude journaling, Thnx4.org. When an organization's members sign up to run a Challenge, they receive regular reminders to record the people and things for which they're grateful on Thnx4; they can share their expressions of "thnx" publicly or keep them private. They're also prompted to complete surveys before and after their Challenge, which can show how members of their organization saw collective changes to their levels of gratitude, happiness, and more. In November of 2016, more than 700 employees across five health care organizations, including Kaiser Permanente, Marin General Hospital, and Dignity Health, participated in a “21-Day Gratitude Challenge” through Thnx4. Surveys of participants showed increases in their resilience and satisfaction with life, along with a decrease in feelings of loneliness. The Greater Good Science Center has a number of experts who speak widely on the science of gratitude. They often deliver keynotes, workshops, and other presentations to audiences of health professionals. Learn more at the GGSC’s Gratitude Speakers Bureau. That webpage also includes summaries of talks they have already prepared or delivered. On October 13, 2015, the GGSC convened more than 40 leaders from UC San Francisco Medical Center, Kaiser Permanente, Sutter Health, Sharp Best Health, Scripps Health, Dignity Health, and other organizations for a half-day event on "Pioneering Gratitude in Health Care." Participants came together to learn about the science of gratitude, hear stories of health care innovators who are applying that science to their work, share current approaches to delivering or infusing gratitude into the culture of health care, and then brainstorm promising paths forward.